A Tuscaloosa native and retired English professor provided some “tidbits” on academic writing and producing a memoir at the Second Annual Writer’s Conference this afternoon. 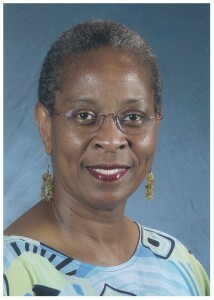 Dr. Trudier Harris, who retired from the University of North Carolina last summer, recounted the experience of producing more than 20 volumes of literature in her 35-year career. When it comes to writing techniques, this retired professor had many to share. “I want to revise until I get something that sounds right.” she said. She talked about writing in the active voice and the use of the specificity of the language. As a visiting scholar-in-residence in the UA English Department, Harris will give a campus lecture, “Nightmares of Fear: Edward P. Jones’s Representation in The Known World of Blacks Owning Blacks During Slavery,” on March 31 at 4 p.m. in Gorgas Library, room 205. She calls herself “God’s Cheerleader” and this morning Vanessa Davis Griggs cheered a roomful of authors and future authors to put pen to paper and sow into themselves. Griggs kicked off a daylong workshop designed to introduce budding writers to different genres for which they can write. The event is sponsored by the Black Faculty and Staff Association (BFSA) at the University of Alabama’s College of Community Health Sciences. According to Griggs, being in the right place may mean turning off the TV. She talked about going to workshops such as one on book marketing sponsored by Mark Victor Hansen who had the successful Chicken Soup for the Soul books. She applauded the BFSA for sponsoring the event for a nominal fee and those who are taking action to make their writing dreams a reality. Griggs, a former Bellsouth employee and library worker gave rousing 30-minute address that includes anecdotes from her path to becoming an author. She’s the author of novels such as Destiny Unlimited, The Rose of Jericho, Promises Beyond Jordan. Her book Practicing What You Preach is the number-one Bestselling Christian Fiction for the June 2009 BCCN1/BCBC National Bestsellers List. She also writes articles for The Birmingham Times, a black weekly newspaper. 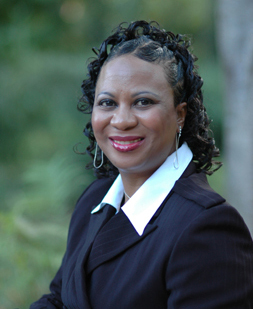 “When I left I had no book deal,” Griggs who recalled how her faith and persistence paid off. A week ago today I pledged to blog once a day for seven days. The idea came from the Society of Professional Journalists Southeastern Regional Conference in Orlando, Fla.
A week later, I have to admit I failed in my attempt, only making it to this page to post three times. But, we are at the Second Annual Writer’s Conference at the University of Alabama. The whole idea of today’s event is to encourage people to become authors. About two dozen people are in attendance at the opening session this morning. “All of us have a story and that story needs to get out as African Americans,” said Pamela Payne Foster, vice president of the Black Faculty and Staff Association, the sponsor of today’s event. The New insight today comes from being in a non-journalism event, non-academic, non-scholarly event talking about news and writing. Eventually I want to have my own book. So perhaps in two years I’ll be at the Fourth Annual Writer’s Conference as a featured book author. Now we understand why it’s very difficult, if not impossible, to staff blog with DAILY posts. I pledged last Saturday to try posting daily for one week. Already, since Sunday, two days have passed without a post. I guess the best thing to do is post on something on which you’re working that day– at least you’re using the blog to augment your already hectic busy day. 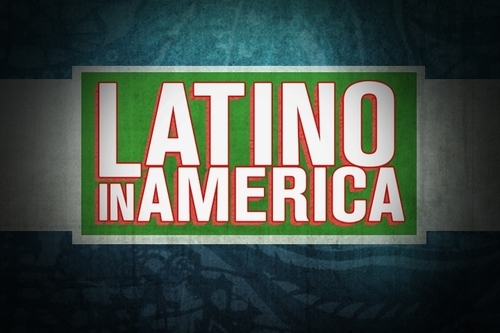 Today we’re preparing to teach our unit on Latino in America, which was both a documentary and a new book, both released last October. Students in my Communication and Diversity course will hold two days of discussions about the book. Then on the third day, we will screen a 45-minute excerpt from the 4-hour documentary. Some like the blog Ponte Al Dia have questioned the real motives in The Time Warner network producing Latino in America, especially after the tactics of former CNN anchor Lou Dobbs. But, elsewhere I’ve read positive comments from those who felt the October 2009 documentary finally told their story. Of course, CNN’s microsite tied to its documentary remains live online. The obvious question is why read the book when you can watch it on TV? Well, the chapters in the book correspond with the stories in the documentary. 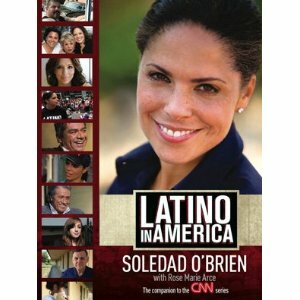 The book was co-written by O’Brien and CNN Senior Producer Rose Marie Arce, who has a background in TV news– having worked at CBS flagship WCBS in New York. I think it’s beneficial to better understand the issues that are brought out in the stories that the producers depicted in the long-form news presentation. Those are my broader objectives. ORLANDO– A couple of years ago there was some discussion at the Society of Professional Journalists about whether to continue the Spring regional gatherings. Fortunately, those naysayers who sought to end the practice of hosting the 2-day events focused almost exclusively on professional training did not get their way. In what traditionally has been known as Region 3 (a number that is insignificant to those outside of the organization), the Southeastern Region, which includes South Carolina, Florida, Georgia and Alabama, has gathered in the Sunshine State THREE of the last four years. While I certainly enjoyed the 2007 conference at University of Florida in Gainesville and the 2009 “unconference” in Hollywood, Fla., the University of Central Florida did some different things that bear a closer look NATIONALLY as SPJ looks to the future of the regional conferences. In fact, UCF Professor Rick Brunson and Chapter President Robyn Sidersky assembled a team of “blue shirts” (name for the SPJ shirts that the team of students wore to help us attendees easily spot them) to put on a student-oriented, forward-looking conference that gave attendees take-home tips that hopefully will translate into them being active members of SPJ. The more than 120 registrants who journeyed here to the UCF campus were treated to a blue-ribbon panel of recent journalism graduates who were a lot more upbeat about their future in the field than many we hear speaking at professional journalism gatherings. UCF Journalism Professor Lance Speere moderates a session Friday featuring recent UCF graduates who are working in journalism. Starting out on Friday afternoon with a “reality-check” from top editors at two Florida news organization, this event did more to uplift, encourage and empower those who participated than most journalism workshops to which we invite those in the field. While Mark of Excellence was big, the talk of social media was bigger. The hands-on training sessions on Saturday were a hit with my students from the University of Alabama. At the same time, there were some industry panels that gave attendees more than just practical tips for specifics technologies or software. Our SPJ President-Elect Hagit Limor made the trek from Cincinnati to not only give a keynote address on Friday night, but share her insights on one of those industry panels. It’s a combination of good, timely industry panels AND professional training with hands-on instruction that made the UCF-sponsored event a success. 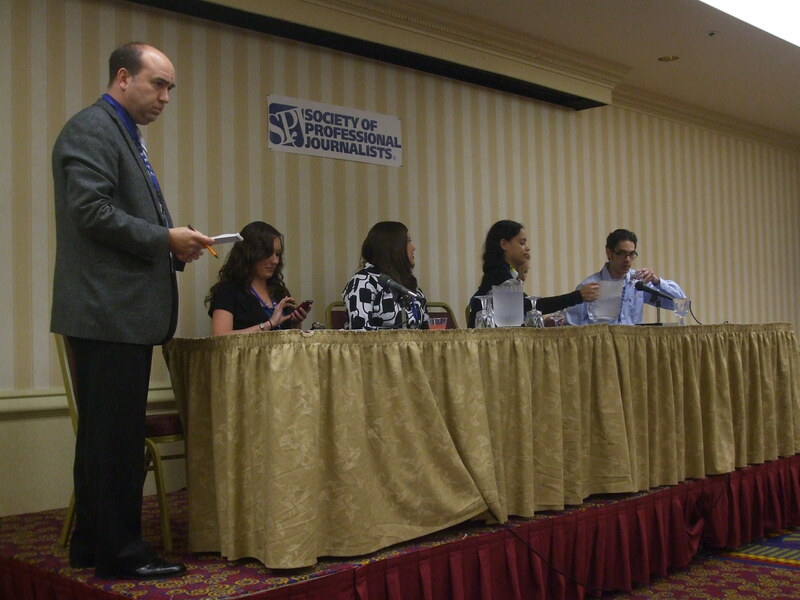 If I count a brief appearance at an SPJ Regional more than 10 years ago in Birmingham, this was my sixth SPJ Regional. It ranks among the best, most memorable for me. SPJ Regional Directors, who are charged with organizing these events around the country, need to look at what Brunson and Sidersky did here in Orlando. From the corporate sponsorships to the return of T-shirts to an SPJ Conference (We used to have those at national convention) to the plethora of cookies/snack breaks and networking opportunities built into the schedule, this is definitely the WAY TO DO IT! 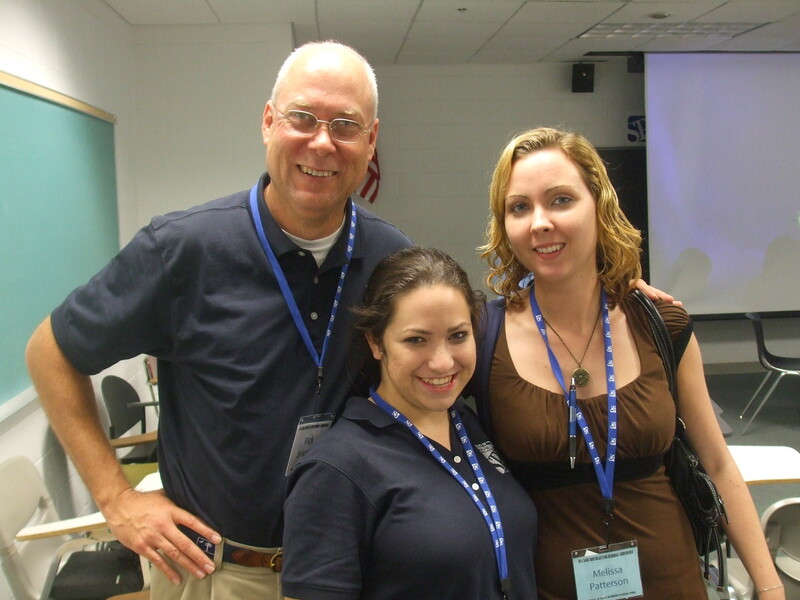 ORLANDO– Three social media sessions in TWO Weeks’ time– an indication of just how important things like Facebook, MySpace, Twitter and LinkedIn are to the world of journalism in 2010. I’m finding myself knee-deep in social media teaching ideas as I reflect on what was learned at two academic conferences and one professional gathering. Etan Horowitz, digital media producer at CNN International, shares his career path with a standing-room only crowd at the SPJ Southeastern Regional Conference at University of Central Florida. Both of these sessions were lead by a 28-year-old former technology reporter at The Orlando Sentinel. I say former because his experience allowed Etan Horowitz to become the social media media coordinator for CNN International. Horowitz’s experience, as outlined in his final tech column at the Sentinel, is a great case study of how the career path for journalists getting into the profession is changing (or has changed). The old “farm team” system may not be the way to a rewarding career, particularly if one is planning to work at places where newspapers have traditionally been the core media product. In my opinion, CNN has been on the leading edge of broadcast journalism’s true embrace of social media. In my previous blog, almost two years ago, I noted how CNN’s Rick Sanchez had broken ground on true integration of social networking into coverage of the 2008 Presidential campaign. At that time, Etan Horowitz was pounding the pavement (Sorry for a very bad cliche) here in Central Florida gathering technology stories and producing a column on tech issues. Today, he’s the man behind the scenes at CNN International as that worldwide news organization seeks to remain relevant in an age of fragmenting audiences, which include those who live on the social networking Web sites. Horowitz did what I consider to be THE BEST JOB articulating a strategy for television (and potentially newspaper) Web sites’ use of the interactivity and virtual community-building that distinguishing social media from the traditional (AKA “old”) media prepared FOR an audience. What I’ve heard at so many conferences like the SPJ gathering is how news reporters and anchors HAVE To be on Facebook and Twitter. News reporters and editors brag about being on the site. Only a handful of presentations have gone beyond the “we have to be there because we need that audience” argument. While this may be true, traditional media practitioners have to move beyond the “do it because our audience is there” argument. There must be a BETTER reason. I think many people have been able to see that Facebook and Twitter can be used as a great reporting tool. Advertising and Public relations practitioners note how these can help in getting the word out about a message, product or event. What Horowitz did was explain HOW journalists, specifically, can take what is on these social media Web sites and produce BETTER journalism. 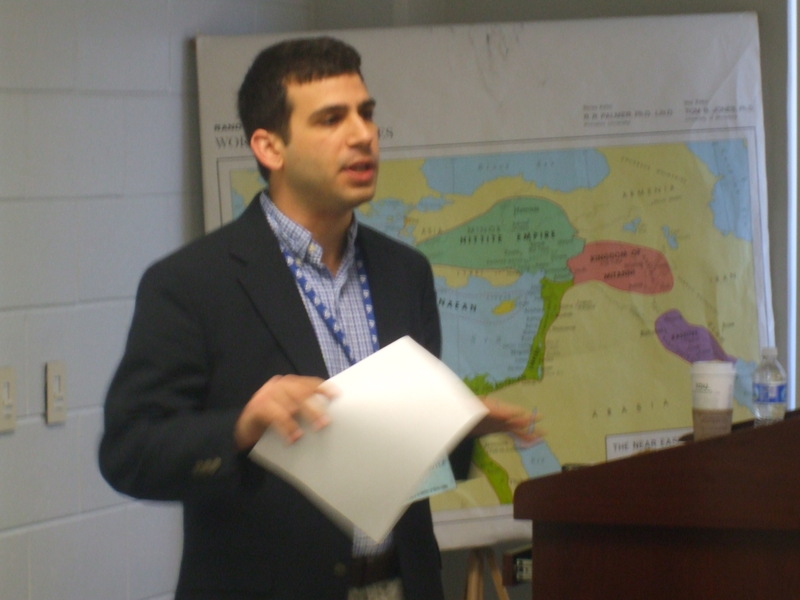 His very focused presentation on Saturday gave me a reason for using the sites in my classes. I was so glad that two of my students were in the room when Horowitz introduced concepts such as crowdsourcing, location-based social networking and crisis mapping. If you don’t know what these terms mean, stay tuned– we’ll define them as we lay out a strategy for elevating what we teach on social media. One week ago at the University of North Carolina at Chapel Hill, I joined more than 100 other journalism mass communication educators and graduate student researchers for the AEJMC (Association for Education in Journalism Mass Communication) Southeast Colloquium. During that conference, there was a session on the role of social media in our mass communication teaching. Most of the discussion centered on how we communicate with students who are constantly on these Web sites. A week before that at the AEJMC Midwinter Conference, one of the last sessions during the weekend of research presentations was an entire panel of emerging research on Twitter and News. Taking the sum total of these two sessions plus what I learned from Horowitz, I now have a sophisticated strategy for what students need to know. Horowitz mentioned crowdsourcing– a way of using what we learn from a gathering of people around a certain topic or issue as a place to find interview subjects. The cluster of users in a social media environment yields a seed for a news story that often is not otherwise known to the journalist. Crowdsourcing is certainly not anything new. It’s a much broader term that has been used in business. Jeff Howe has written about it in WIRED years ago. But, in the context of a social media strategy, it’s at least one step beyond just being on Twitter or Facebook. Likewise, examining the tweets (those 140-character micro blogging posts on Twitter) for WHERE they are can yield yet another important detail on the location of a possible story. Horowitz explained how he used various Web sites to research tweets and get a better handle on the reaction to various news stories. “The key now with Twitter is the location,” Horowitz said. But, it’s not just about crowdsourcing or location-based social networking, we also have to realize that those locations are critical when reporting a crisis such the recent earthquakes in Haiti and Chile. Our charge as journalism educators is to convey how social media mapping tools can elevate a flat, traditional story with an entirely new dimension. At the end of the day, what we teach about social media — and YES, we MUST TEACH it. Most of the students, who took up the greatest number of seats here at the SPJ Regional Conference, were unaware of the tools that Horowitz shared. That means if we educators take these tools introduce them as we teach, our students will be that much better prepared to work in newsrooms that are figuring out how to use social media. ORLANDO– If you want to know how to do video and don’t have a television production background, you should have been at the SPJ Southeastern Regional Conference this weekend here at University of Central Florida. I just emerged from Matt Sokoloff’s “Videography for Reporters” workshop and it’s quite clear that Tribune has the right man leading its online products division. I’ve been to numerous sessions at conferences on video and have been in the sometimes uncomfortable position of teaching such a workshop. As a TV person, it’s hard to know what to tell someone who has LITTLE experience with a video camera. Sokoloff hit the nail on the head with his great suggestions. I’m ready to implement many of his suggestions with my next Web video.